Bristol Palin holds brother Trig Palin while sitting next to her boyfriend Levi Johnston on day four of the Republican National Convention in September. Bristol Palin's ex-fiance said fighting tore the teen parents apart but that he wanted to get back together with his high school sweetheart. Levi Johnston said an argument caused his breakup with the daughter of vice presidential candidate Sarah Palin "a week, two weeks ago" and that they both needed time to grow before getting married. "We were just, we were in a fight," said Johnston, 19, during an interview with "Good Morning America." "And trying to see if we can make things work. But this is what it kind of ended up turning into. But we'll see what happens." Johnston said will be there for their two-month-old son regardless of what the future brings for the young couple -- but he hopes to reunite with Palin. "We've both had our tough times with each other and we'll see what happens," Johnston said. "I mean, I'd like to get back together with her. I don't know what she's thinking one day, but whatever happens, happens. I mean, I'll still be there for the kid, still help her out, that kind of thing,"
Bristol Palin, 18, split from her fiance after she reportedly referred to the family of the hockey-loving high school drop-out as "white trash" and has been rumored to have made it difficult for her former beau to see their two-month-old son, Tripp. "I'd give anything for [Tripp], to be with him," Johnston told GMA. "[There are] a lot of changes when you're a father, when you hold him for the first time, you know. I don't do a lot of things I used to anymore, I'll tell you that." Johnston said he didn't feel any pressure from the Palin family. "They're good people," he said. "They don't push me, you know. They kind of they don't really tell us what to do, they don't tell us, you know, they're good people. So I like 'em." And he didn't rule out the possibility that the young parents would get back together. "We'll see, we'll see how it is," he said. "We'll just remain friends for now. We're both cool with that decision, and we'll see." Over the weekend, Alaska Gov. Sarah Palin told People magazine that her daughter was "doing great" though she offered few details on the nature of the breakup. 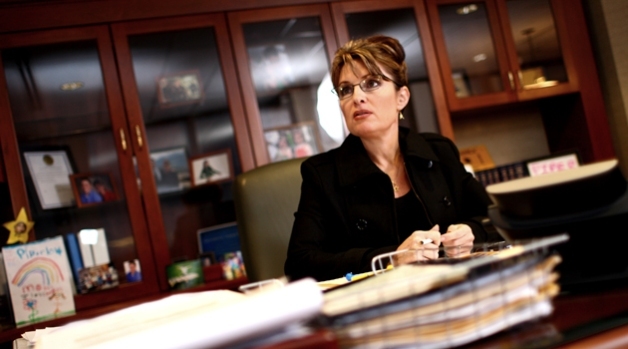 "Bristol is doing great, just great," Palin told People magazine. Palin spoke to People during an appearance with her family at a Juneau grocery store to help sell Girl Scout cookies this weekend. Palin had her infant grandson in tow but Bristol was nowhere in sight. "And this is my grandbaby, Tripp," the elder Palin told a crowd of Girl Scouts as she gestured toward daughter, Piper, who was bottle-feeding the newborn. "He's only two-months old. It's kind of surreal." Palin told the magazine that Bristol didn't make an appearance at the store because she was playing mini-golf. "Bristol is over at the state capitol building golfing in a miniature golf tournament," Palin said. "It's a fundraiser and she's up there taking my place while I'm here."